I like nothing better than to follow some bubbling rill up a mountain – it makes a delightful companion and almost always will lead me to a superb painting subject. Some of my most memorable moments in the hills has been climbing up a gill or gorge, staying as close to the water as possible, and often right in it! The combination of rocks and tumbling water I find irresistible, and in the current (July) issue of Leisure Painter Magazine you will find my article on painting moving, tumbling water. The image shows part of a watercolour from my Mountains & Moorlands in Watercolour book, where a small cascade is falling between rocks. Painting cascades and waterfalls is all about contrasts: the contrast between the hard edges of rocks and the soft ones of the falling water where it passes in front of those rocks; and that of the white, aerated water against the wet, dark rocks. Too much of one or the other will weaken the effect. I also often break up the vertical elements with a small tree or branch, or perhaps a sprig of heather drifting in front of the falling water. The preponderance of cool black – grey – blue – white can induce a feeling of cold austerity in the eye of the viewer, so in the above painting you will see that I’ve included a splash of red in the bottom right. One final tip: a few small flecks of white against the dark rocks and close to the falling water creates a sense of movement and splashing. You can do this with deft stabs with a scalpel, a few blobs of white gouache, or by spotting in some masking fluid before you start the painting, to reserve those tiny whites. Another final tip: waterfalls are at their best after heavy rain, so get out there while it’s still sloshing down for the best images, but be sure to keep all your accoutrements dry!!! 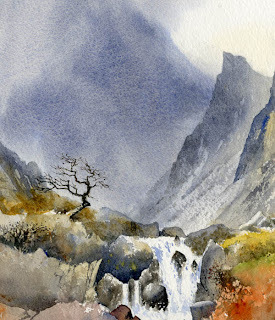 This entry was posted in David Bellamy, Watercolor waterfalls painting by David Bellamy. Bookmark the permalink.